When building a rig, most builders optimize aspects of their PC such as the graphics, processing power, and storage space before sound. 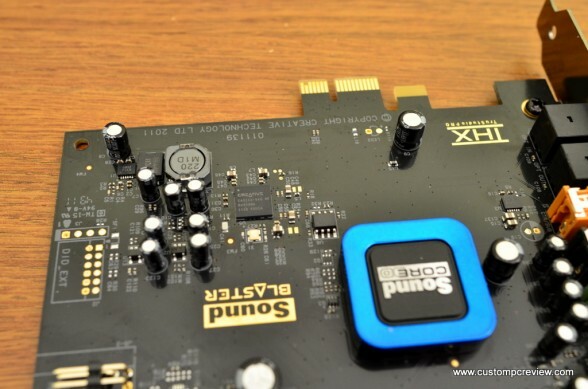 Yes, it is true that on-board sound has come a long way from what it once was, and yes in this day and age the sound card really doesn’t do much gaming performance wise considering the power of today’s processors, but if you really want to experience true audio bliss in your music, games and movies, you’ll inevitably need a dedicated sound card. When it comes to sound cards, there are really at most a couple companies that have survived in this game. One of them, is Creative, and they’ve long been one of my favorites. With previous greats such as the X-Fi line of sound cards, the company has time after time proven their expertise in this field. So, with great pleasure, today we are going to review the Creative Sound Blaster Recon 3D PCI-E soundcard. 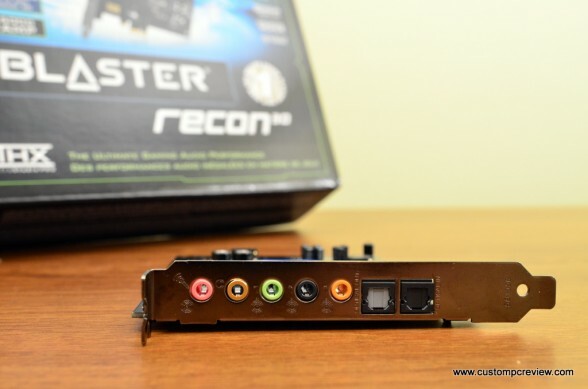 As the future Creative entry level gaming sound card, the Recon 3D incorporates Creative’s new Sound Core3D Quad-core Digital Signal Processor which features THX TruStudio Pro, CrystalVoice, 5.1 Surround Sound support, Dolby Digital Live encoding, and a “Scout Mode” that Creative claims will allow you to better hear your enemies giving you a tactical advantage on the battlefield. Well you’ve heard enough of the intro, and we’ve got a product to the test, so is the Recon 3D a worthy successor to the Creative name? Let’s find out! Notice from the specifications that you will need Windows 7 in order to use this sound card. Make sure you have it otherwise, the drivers aren’t going to install. Honestly, if you’re still rocking XP though, it’s time to move on. Creative has included a very sparse amount of accessories with the Recon 3D PCIe. All you get is the driver CD, a quick start guide, and a support guide. Here’s a quick look at the Recon 3D itself. The entire PCB seems quite sparse. Doesn’t look like there’s much on this thing when compared to some of the older X-Fi cards. Front panel audio header right at the edge of the card is good. Again, the PCB looks quite plain. It’s surprising how little is going on here. 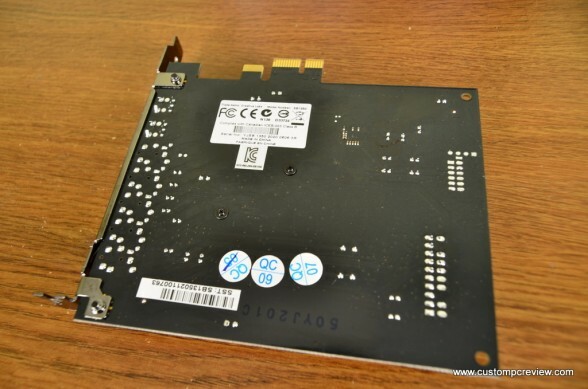 The card does require a PCIe 1x or greater slot available, so make sure you’ve got one. Yes, PCIe 1x cards will fit into PCIe 16x slots. 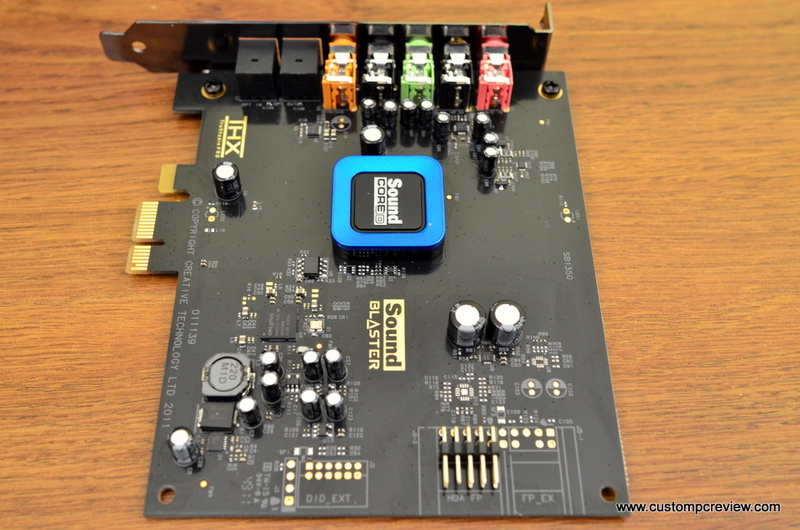 Here’s the brains of the Sound Blaster Recon 3D, that quad core Sound Core 3D processor. Around the back, the card is quite empty as well. Seems like the PCB doesn’t even really need to be as big as it is. Otherwise, I’m definitely digging the black PCB. Much better than blue or green. Finally, let’s move on to the business end of things. 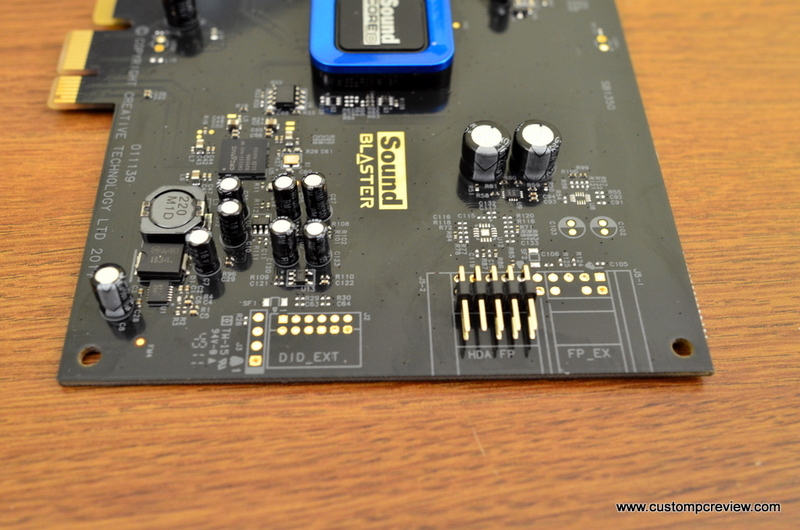 The card has the ability to output 5.1 channel audio and has an optical input and output. One of the first things you’ll realize about the software suite is that it’s suprisingly not as loaded with useless apps like it used to. The installation process felt very quick and lightweight, and the software installed without any issues. Once the software is installed, you can fire up the control panel and one of the first things you’ll notice is that Creative has revamped the layout when compared to the older X-Fi control panel layout. This one is much simpler and more intuitive than the old one, but seems to have less options as well. 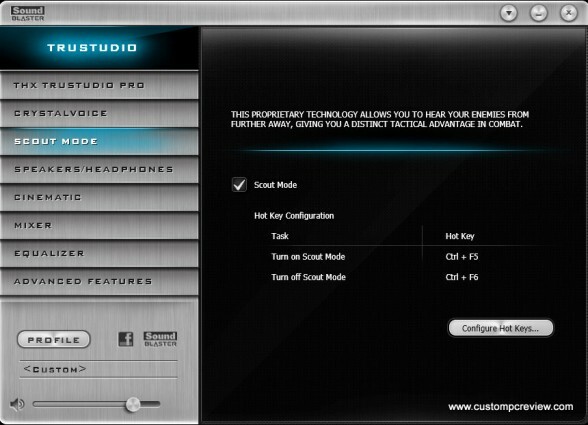 Above, we can see the first screen that pops up, the THX TruStudio Pro settings. THX TruStudio Pro has been one of the major features Creative’s been pushing onto their sound products lately and it’s actually something I found to be quite good. As you can see above, THX TruStudio Pro is actually a combination of a couple Creative sound processing technologies which you get to adjust. You get the surround effect, the Crystalizer (Which boosts highs and lows on lossy, compressed music), bass adjustment, smart volume which normalizes the volume as well as dialog plus which, as you may guess, enhances voices over background noise. Unfortunately I did find smart volune and dialog plus to cause issues by boosting levels of certain sounds too much while muting others so your mileage may vary on this one. 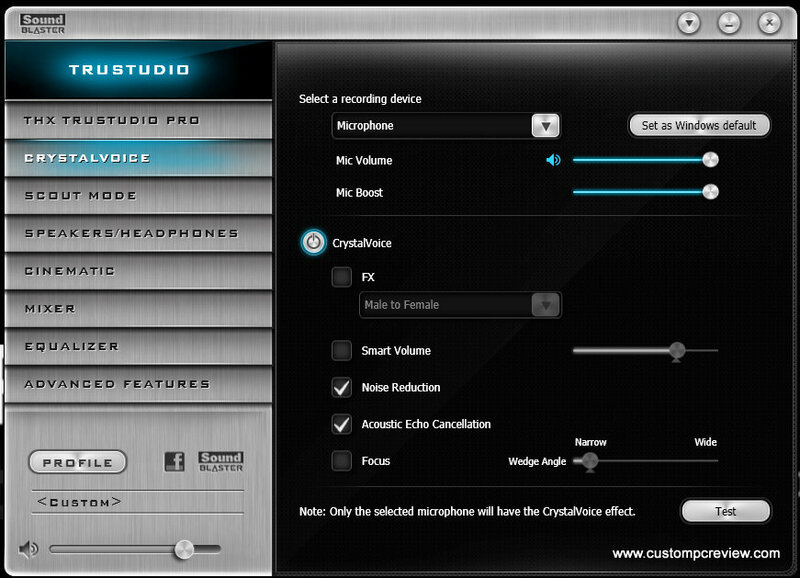 The next tab down gets you into the Crystal Voice feature of the Recon 3D, which I also found to be quite good. While using Skype or Ventrilo, people are able to notice the background noise reduction which is great if you’re running those 3,000rpm fans. Additionally, you also get the ability to change your voice into some of the different specified presets such as a dwarf, elf, or Darth Vader which is great amounts of fun. If you’re looking for that perfect way to secretly troll on Ventrilo, this is it. Scout mode is actually pretty interesting and it just so happens to be one of the major selling points of this card. What it basically does is allow sounds like footsteps, gunshots, and voices to be more clearly heard while minimizing extraneous background noise such as explosions and vehicle sounds. For testing, I played a lot of Battlefield 3 and what I found was that while you are actually able to hear footsteps and gunshots better, it does make the gaming experience a bit strange (for lack of a better word). Explosions no longer sound like explosions, and the sound of vehicles rumbling around no longer sound right. 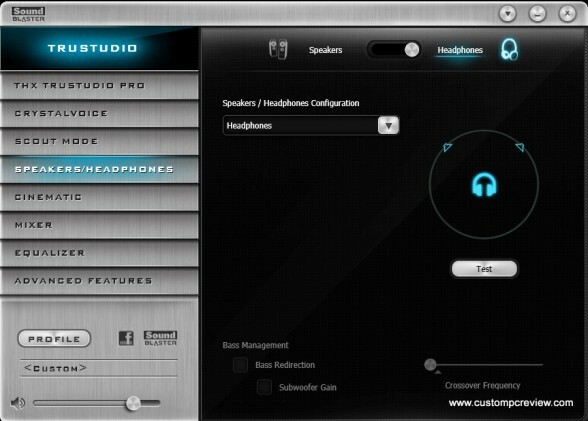 There’s not much to say with the speakers/headphones menu, but here you can easily switch between speakers and headphones which is very useful especially for those who aren’t that familiar with going into the Windows audio properties. You also have the option of testing the speakers here. 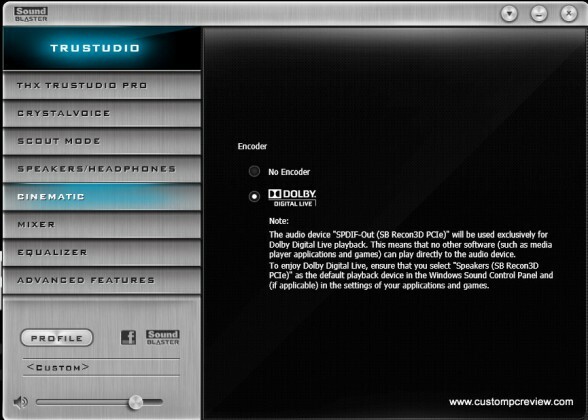 Here we have the Cinematic menu where you get the option of enabling Dolby Digital Live. What this does is convert whatever audio signal is being output by your PC into a Dolby Digital 5.1 optical audio signal which then feeds into something like an audio receiver allowing you to utilize the full 5.1 channel capabilities of your audio system. 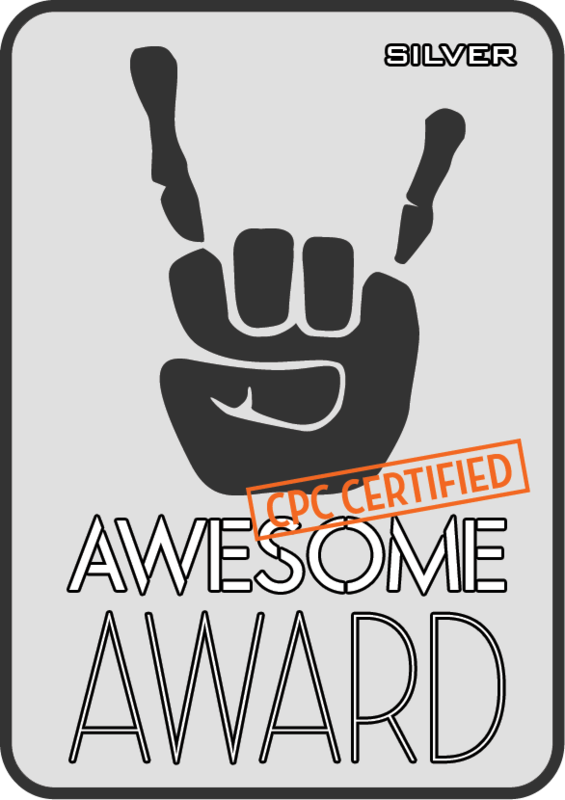 This is especially great for those planning to purchase this card for use in a media center PC. Additionally, I found the sound quality coming through the Dolby Digital Live encoder to sound a bit better overall as well. Finally the software also allows you to save, load, import, and export profiles which is great if you like using a certain profile for say FPS games while using a different profile for movies and music. The profile manager also comes preloaded with a couple profiles such as Fatal1ty’s favorite profile so you can definitely try that out. Since the Sound Blaster Recon 3D is a gaming oriented sound card, naturally the first thing I did was fire up Battlefield 3 and I was immediately impressed with the sound. The surround function on THX TruStudio Pro worked flawlessly and I felt the soundstage really opening up and fully taking advantage of my speaker setup. I also found the Crystalizer function to work very well too, providing me with much cleaner and crisper audio. While I can’t say for sure (since I didn’t actually look it up) I’m going to bet that the Battlefield 3 in game audio is quite lossy considering how much better it sounds after being processed through the Recon 3D. 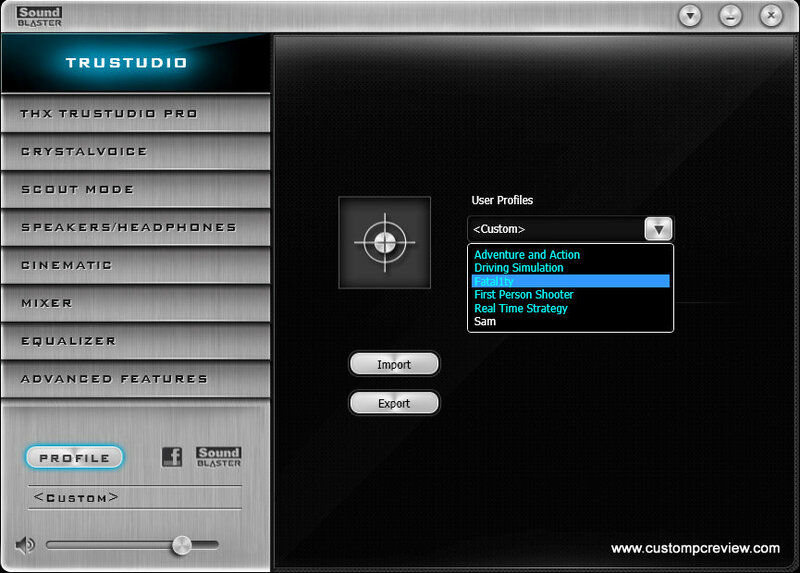 Additionally, for those rocking headsets, the audio positioning function worked flawlessly. While testing the Recon 3D with the Sound Blaster Tactic 3D Sigma headset, I found the sound quality to be an improvement over the USB soundcard included with the Tactic 3D sigma as well. As far as movies were concerned, I popped in Sucker Punch on Blu-Ray and again the sound was phenomenal. Unfortunately, I didn’t have a 5.1 speaker setup for testing, so I wasn’t actually able to fully hear the DTS-HD Master Audio 5.1 surround track in all its glory. Additionally, for the purposes of movie testing, I also did some testing on YouTube, Hulu, Amazon Prime Video and Netflix. After all, most of us don’t own a large collection of Blu-Rays and don’t even have Blu-Ray drives either. In order for these services to stream video studder and lag free through the internet, compromises are made to the audio quality and here’s where I thought the Recon 3D’s THX TruStudio Pro functions really shined. Crystalizer, surround, and bass enhance worked flawlessly to process the audio track which made highs, lows, and mids sound a lot cleaner and crisper overall. Finally we have music performance and again, I did notice the sound coming out to be much crisper and clearer with Crystalizer enabled, especially with lower bitrate music files. Surround is great as well; however, the music does feel a tad bit processed when that’s added in especially if you’re not used to the surround feature. For those rocking high bitrate (320Kbps+) or lossless music, I’d just leave all the sound card functions turned off. The Recon 3D worked as advertised and worked very well. 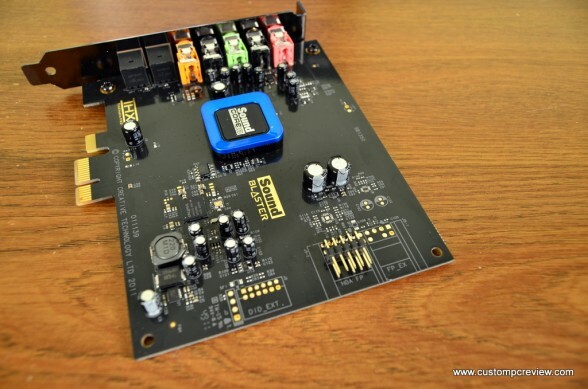 If you find yourself constantly listening to lossy audio tracks, this sound card could be a very worthwhile investment especially if you’ve got a higher quality pair of headphones and the popping, hissing, and crackling is driving you insane. Additionally, Creative seems to have finally listened with their latest drivers. Installation was a lot less painful than previous Creative products, and a lot less random, useless software is bundled with the drivers which is great in my book. I’d still like to see a custom option when it comes to driver installations for what I want installed and what I don’t, but I’ll take what I can get. Unfortunately for those audiophiles in the crowd, you might not be impressed with the Recon 3D. The sound quality isn’t going to be quite as good as say a Xonar STX or X-Fi Titanium HD, and it really isn’t meant to be either. What it’s meant to be is an audio processor that improves sound quality on integrated audio especially for compressed, lossy audio. Unfortunately, price on the Recon 3D right now is around $95 on Amazon, so this is still a pricey card however, considering the discontinuation of Creative’s X-Fi Titanium line of products and most likely the discontinuation of driver support for those products, I don’t see many alternatives out there for the price range. 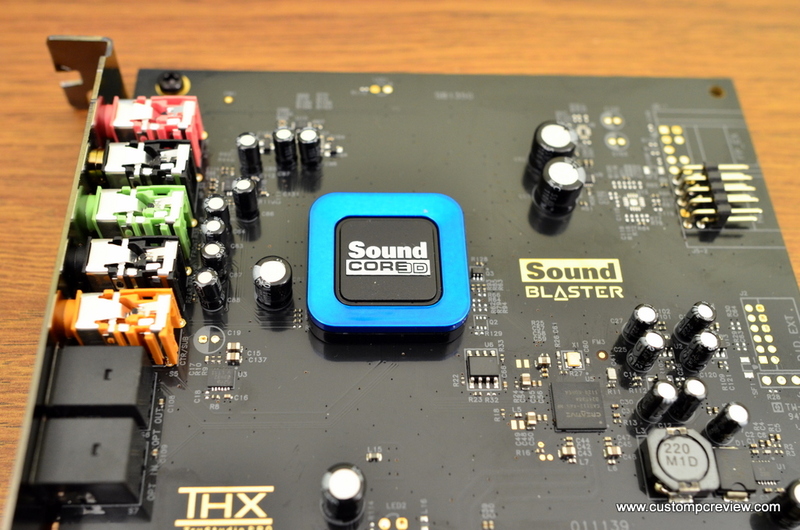 If you’re in the market for a sub $100 soundcard, this is undoubtedly a fantastic choice. It completely demolishes integrated audio and it doesn’t take an audiophile to notice either. Yeah, it isn’t the best sounding sound card out there, but it is good enough for the 99%, especially those who listen to a lot of lossy, compressed audio sources. Additionally, if you’re looking for something to outfit that HTPC rig, I’d say go for it as well. 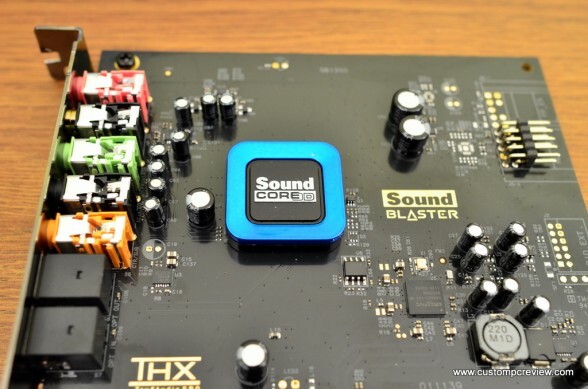 This sound card supports full 5.1 channel audio and would interface very well with any home theater setup. 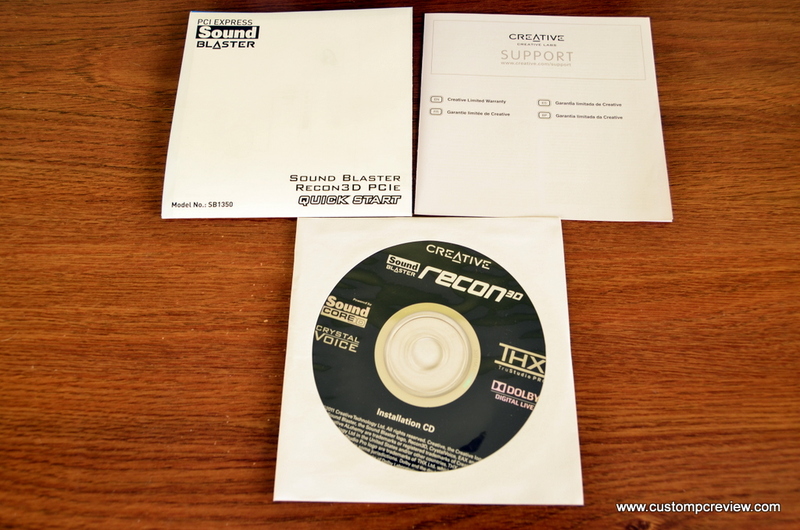 The Creative Sound Blaster Recon 3D is currently available on Amazon. What system did you install this on? The Audigy and X-fi have issues with systems that have 4gb of ram or more on a 64bit os. 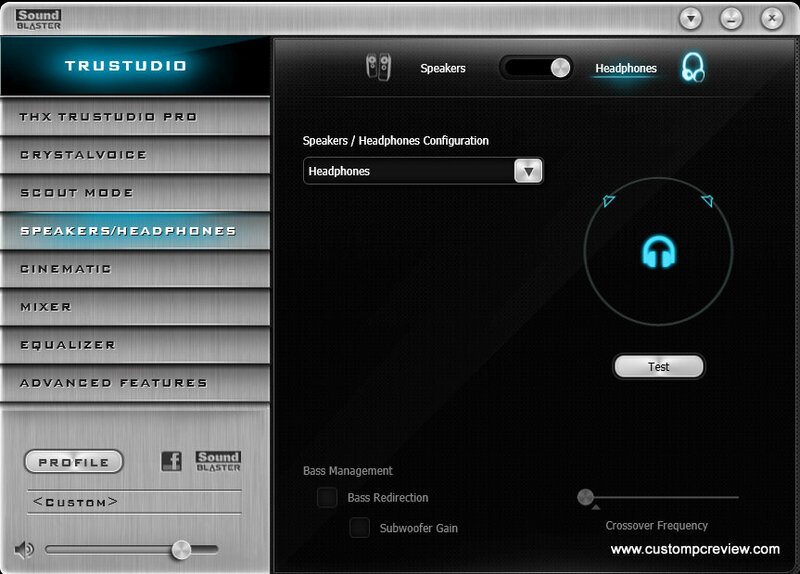 For instance my Audigy 2 ZS Platinum on win7 64bit with 6gb of ram has no mic. You can hear yourself when you talk into it but if you go on ventrilo or even try recording something with windows sound recorder it will sound like you are talking through a fan in a cave its so choppy. Take out 4gb of ram and run on 2gb and it works fine. X-fi users experience crackly audio output under the same situations. 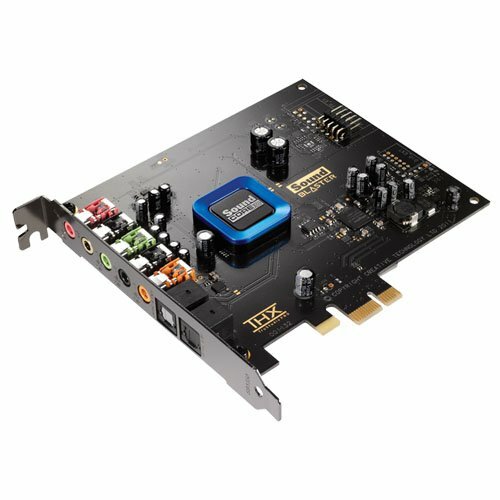 Hi there :).I want to ask is this soundcard gona be frendly with my Home Entertaiment System.My home entertaiment spekers are Samsung HT-D330.So far im using onboard sound card and im aint happy with it.Mainly becuz i cant listen to 5.1.All iw ant From this card is to be able to play games and muzic on all speakers in other words to be suround.If it doz that im buyng it without hesitation. Sorry for my gramar im not used to speak english as im more Lithuanian,Russian. If u wodu replie taht woud be very helpfull :).Thanks.